Bold and beautiful is the name of the game here with this 20 x 63" scarf. The background is about equally white, black and shades of grey. The pop of color comes from huge hibiscus flowers in coral shades from a light peachy pink to a deep orange/red. Perfectly complimenting the scarf is a corded necklace, made using nylon/spandex cording. It looks very much like suede cording, actually. The length can vary from about 16 to 19 inches with a center jeweled piece that adds almost 4 inches. It is done in a coral, grey and black. 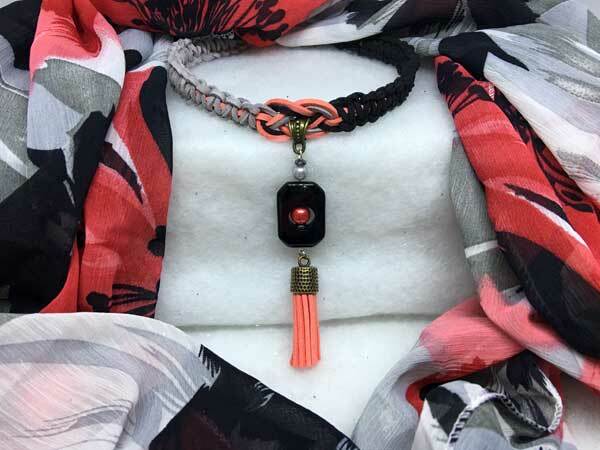 The jeweled piece starts with a rectangular octagon in onyx with silver and deep coral pearl beads. Hanging from that is a fun coral tassel. The piece is finished with a lobster claw clasp and added chain for more versatility with the length.